If you’re obsessed with limited edition products as much as I am, you already know the concept of NIKEiD is pretty much as limited as it gets. Pick any shoe, choose your own color and fabric combinations, then run off and floss your 1 of 1 sneaker creation. Yes Nike has blessed us with this pretty amazing creative opportunity, yet sometimes they still maintain control and say things like, “no you can’t have a gray cement swoosh,” or “sorry that overlay can’t be done in nubuck.” Sigh. Well it’s time to breathe a sigh of relief because for the month of November only, NIKEiD is featuring the AF1 high and low with a glow in the dark option that can be applied to ANY OR ALL parts of the shoe! 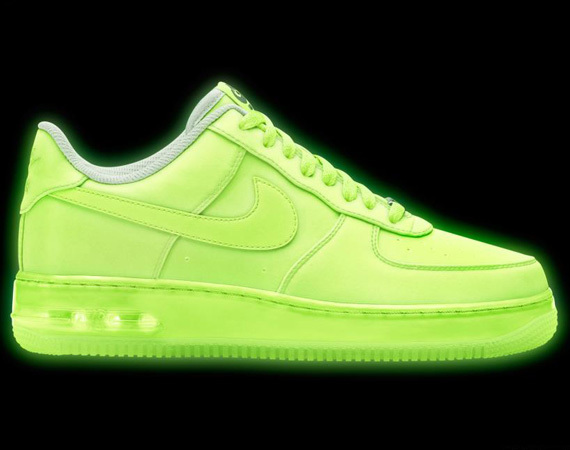 AF1 Low – ALL GLOW! Now you can stand out from the crowd in daylight or darkness. Narciso Rodriguez for Khols Early Release!